Automatic identification system refers to an automatic tracking technology which provides the information about the traffic of the marines. Automatic identification system helps in better traffic management and prevention of possible maritime collision. It has been observed that automatic identification systems are mainly used for providing safety to the vessels. Global automatic identification system market is expected to flourish at a CAGR of 4.8% during the forecast period. Further, the market of automatic identification system is expected to garner USD 272 Million by the end of 2024. In recent years, marine industry has witnessed huge growth all over the globe. Increasing demand for better maritime traffic management and advancement in marine transportation is expected to drive the growth of the global automatic identification system market. In the terms of regional platform, North America dominated the overall automatic identification system market in 2016. Further, North America region is expected to continue its dominance over the forecast period. This can be attributed to the high maritime security in the region. Further, rising government participation in the adoption of automatic identification system is expected to foster the growth of the automatic identification system market. 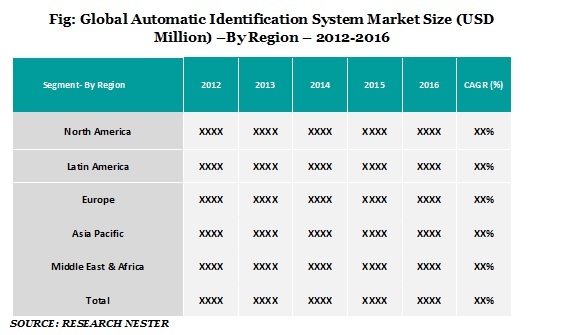 In North America region, U.S. accounted for the largest market share of automatic identification system market. Additionally, rising adoption of automatic identification system by the U.S. Coast Guard is anticipated to garner the growth of the market in the nation. Further, Canada is also expected to contribute significantly to the growth of automatic system identification market due to the stringent government rules and regulations. Further, Canadian government has made it mandatory to install automatic identification system in the vessels. This factor is expected to fuel the growth of automatic identification system in the nation. The growth of global automatic identification system market can be attributed to rising volume of seaborne trade. Further, this rising growth of overseas trade is resulting in augmented demand for effective marine traffic management which is likely to boost the growth of the automatic identification system market. More importantly, huge growth in the GDP of the growing economies is anticipated to fuel the growth of the international trade. According to the Society of Maritime Industries, global economic expansion is projected to double the seaborne trade by 2030. This factor is expected to upscale the growth of the automatic identification system globally. Stringent rules & regulations to minimize the marine accidents are expected to propel the growth of the automatic identification system market. Specifically, strict directive of the International Maritime Organization to install automatic identification system in the vessels is uplifting the growth of the automatic identification system market globally. On the contrary, high cost of the automatic identification system technology is likely to hamper the growth of the global automatic identification market. That aside, technological limitations such as range limitation and lack of reporting facilities between marines and on shore authorities is anticipated to hinder the growth of the global automatic identification market.